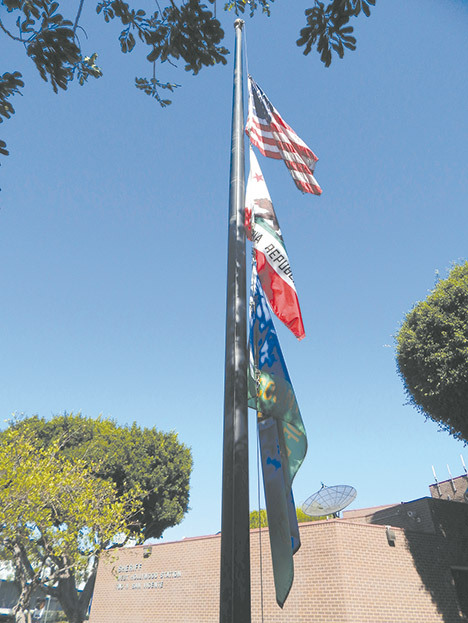 Flags were flown at half-staff on Oct. 6 at the West Hollywood Sheriff’s Station and all other county buildings to commemorate slain Los Angeles County Sheriff’s Department Sgt. Steven Owen, who was shot and killed by a burglary suspect in Lancaster on Oct. 5. The sheriff’s department issued a statement calling Owen, “A true hero who died while serving his community.” Owen, 53, was a 29-year sheriff’s department veteran. The sergeant was shot shortly after noon while responding to a 911 call of a burglary in progress. He died later at a hospital. The suspect, who was only identified as a 27-year-old Antelope Valley resident, was taken into custody shortly after 2 p.m. The suspect was shot by deputies but is expected to survive. The sheriff’s department confirmed that detectives are investigating the circumstances of Owen’s death as well as the officer-involved shooting of the suspect. Sheriff Jim McDonnell thanked the public and fellow law enforcement officials for an “outpouring of sympathy and warm wishes.” The sheriff personally met with Owen’s family on Thursday. Mayor Eric Garcetti also issued a statement about Owen’s death.